Loveman Steel employs a stable of plasma- and oxyfuel-cutting tables to provide unique fabrications quickly to a diverse customer base. The speed of plasma cutting, assisted by recent retrofits, over oxyfuel has won business from customers anxious for rapid turnaround. Founded in 1939 in downtown Cleveland, OH, Loveman Steel opened its doors as primarily a steel service center to serve the city’s thriving manufacturing base. Over time, as the local factory population thinned, the company sought new ways to attract customers and grow its fabrication business. “About 30 years ago, we evolved to focus equally on the service center as well as fabrication,” explains Robert Loveman, executive vice president of Loveman Steel and representing the fourth generation of the family-owned business started by his great-grandfather David. 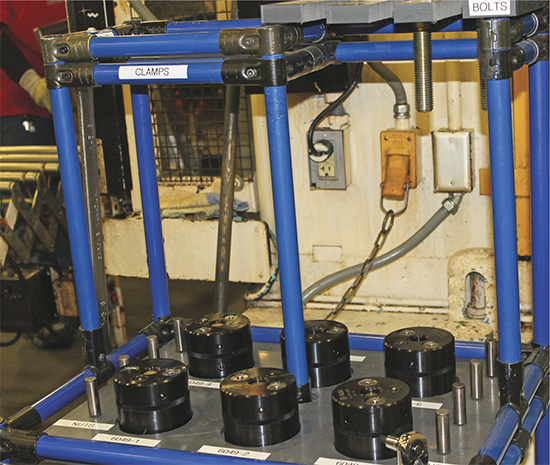 Growing its service-center business and finding itself producing more and more parts for its steel suppliers, company management decided to focus on ramping up its capabilities as a job-shop fabricator. Today, Loveman Steel, ISO 9001-2008-certified with its 85,000 sq. ft. of manufacturing space spread across 3.5 acres, calls Bedford Heights, a Cleveland suburb, home. Here it has developed a couple of niches: taking on large and/or difficult projects that others won’t touch, and providing annealing-hardware fabrications for mills. 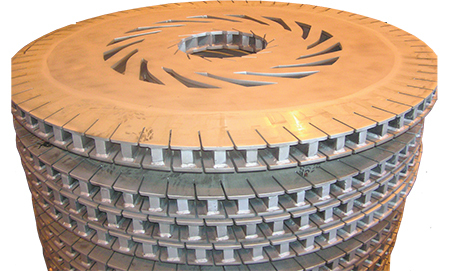 To succeed in these sectors, the company has relied in large part on plasma-arc cutting (PAC). Two PAC machines dot the Loveman work bays, sharing space with oxyfuel-cutting tables and other fabrication and welding equipment. Loveman’s 65 employees primarily work one shift for service-center operations, while fabrication functions across two. Plasma-cutting capability allows Loveman to win work fabricating convector plates used in coil annealing. The plates shown here, fabricated from carbon steel, rest between coils as coil stacks sit in an annealing furnace. Each plate consists of two face plates with ribs sandwiched between. Plasma-cutting tables cut the plates and ribs, and also cut plate holes and notches in a swirl pattern (the ribs are cut in a curved pattern to match the arc of the plate patterns). At Loveman, five oxyfuel tables cut chunkier carbon steel, anywhere from 4 to 24 in. thick. A 260-A combination plasma and oxyfuel table, 160 in. wide by 594 in. long, cuts stainless to 1.5 in. thick and carbon steel to 1.5 in. thick. On this table, a Hypertherm (Hanover, NH) HPR260 PAC unit installed a couple of years ago replaced an old burned-up unit, according to Loveman officials, with a water table also added to accommodate longer, wider plates. The plasma unit, using HyDefinition technology to align and focus the plasma arc, delivers numerous benefits, according to Hypertherm officials, including improved arc stability, narrow kerf width to enable fine feature cutting and minimize material waste, dross-free cutting to minimize part cleanup, and repeatable cut-edge quality. Also at Loveman, a recently retrofitted 600-A PAC water table, 156 in. wide by 552 in. long, cuts stainless and carbon steel to 2 in. thick. This table boasts a recently retrofitted Burny 10 control system from Lincoln Electric (Cleveland, OH), replacing outdated, unsupported controls. The retrofit also included a new Esab (Florence, SC) torch lifter and torch-lifter controls. With its tables humming and backed by various other forming and joining equipment, Loveman churns out a diverse collection of fabrications. Its PAC capabilities have brought the speed, flexibility and accuracy necessary to turn these jobs at a profit while satisfying strict customer quality and precision requirements. “If we had to rely on oxyfuel cutting instead of plasma, we couldn’t compete on many of these jobs,” explains Loveman’s Rob Campbell, maintenance supervisor. Slicing through 0.375-in.-thick carbon steel at an average of 150-200 in./min (about 90 in./min. for thicker material), the plasma-cutting tables work fast, whereas oxyfuel often limits out at about 10 in./min. In addition, Loveman works plenty with stainless steel, and oxyfuel is no option there. 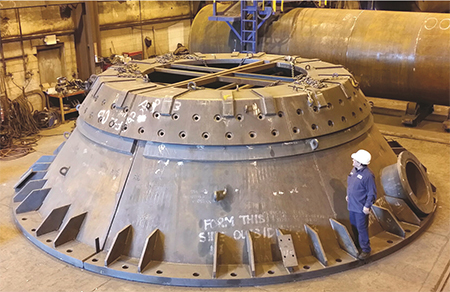 Loveman Steel will receive emergency calls from mill customers at any hour to fabricate one-offs to replace broken process-equipment pieces, large and small. Convector plates used in the steel industry serve as one example of challenging work undertaken by Loveman made possible through the use of plasma-cutting technology. Plasma-cutting tables cut the plates and ribs, and also cut plate holes and notches in a swirl pattern (the ribs are cut in a curved pattern to match the arc of the plate patterns). The intricate work would eat up too much time if cut via oxyfuel, so PAC gets the call. Plasma-cutting speed is huge at Loveman, where the company will receive emergency calls from mill customers at any hour to fabricate one-offs to replace broken process-equipment pieces. Indeed, the list of Loveman’s recent and repeat customers reads like a Who’s Who. Within the past five years, the company has completed projects for U.S. Steel, Severstal N.A., AK Steel, Sun Coke, Allegheny Technologies, Nucor, Metso Minerals, Mitsubishi-Hitachi, North American Stainless and Arcelor Mittal. Beyond its clients in the material-producing and finishing industries, Loveman serves the power-generation, material-handling, petrochemical, aerospace and transportation industries. All of these industries employ unique pieces of equipment that operate under the harshest conditions, and it’s only a matter of time before a breakdown occurs. Loveman has demonstrated to these customers that it can handle whatever may come its way, and deliver as promised. Sometimes that requires extra elbow grease, especially on larger parts. One recent project, recalls Loveman, necessitated fabricating a large 100-ft.-dia. assembly in 24 pieces, trial-assembling and truing it outdoors to ensure proper fitup, and disassembly into 24 pieces for delivery by truck to the customer.